NASA Saturn-studying Cassini probe has delivered a photographic holiday package. Two newly released Cassini images show three of Saturn‘s frigid moons hanging in space like gaudy cosmic ornaments, girded by the massive planet‘s magnificent rings. The pictures, from Cassini‘s imaging team, show Saturn‘s largest, most colorful ornament, Titan, and other icy baubles in orbit around this splendid planet. The release includes images of satellite conjunctions in which one moon passes in front of or behind another. Cassini scientists regularly make these observations to study the ever-changing orbits of the planet‘s moons. But even in these routine images, the Saturnian system shines. 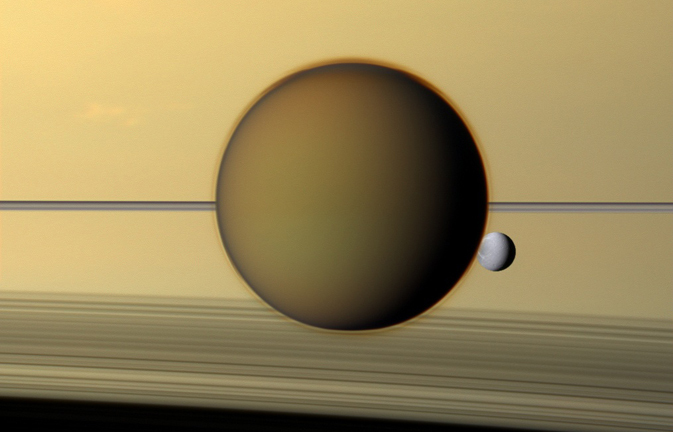 A few of Saturn‘s stark, airless, icy moons appear to dangle next to the orange orb of Titan, the only moon in the solar system with a substantial atmosphere. Titan‘s atmosphere is of great interest because of its similarities to the atmosphere believed to exist long ago on the early Earth. While Earth‘s northern hemisphere is just now shifting into winter, it’s currently northern spring in the Saturn system and will remain so for several years. Northern summer is due to arrive in 2017, and Cassini should be around to see the seasons change. NASA has extended the mission of the spacecraft, which launched in 1997 and arrived at Saturn in 2004, through 2017.